Richmond Dental and Medical enjoyed exhibiting recently at one of the premier events on the dental trade show circuit, CDA Anaheim 2018, a gathering of the California Dental Association. The annual event, held from May 17-19 at the Anaheim Convention Center, attracted over 26,000 dental professionals and their guests. 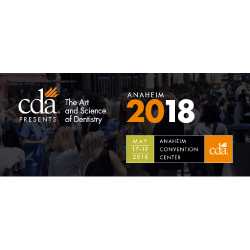 About 7,000 dentists and dental students, another 8,000 registered dental assistants and registered dental hygienists, and nearly 2,600 office staff attended CDA Anaheim 2018 for networking, continuing education, and learning and purchasing from dental equipment, technology, and supply companies like Richmond. At the Richmond Dental and Medical Booth, attendees met with account manager Fran Eskew, placing orders through multiple distributors to take advantage of the company’s show specials. Richmond had a very successful show, with an expansive booth garnering visits from more than 500 dentists and dental professionals, who took home product samples of the company’s dental supplies ranging from braided cotton rolls to nonwoven sponges and face masks. In a special turn, more than 1,500 dental professional members of CDA, including 800 dentists, agreed to provide medical care to underserved members of surrounding communities. For the eighth year running, the free dental care event, an initiative of CDA Cares, saw heavy demand, as CDA members treated more than 1,900 pre-screened patients with a variety of needs (extractions, fillings) and preventive cleanings.